"Simple, inexpensive, and hearty. My boyfriend and I love this different take on boring tomato soup. Best of all, it is very low in calories. Add shrimp for a protein boost." Heat olive oil in a large stockpot over medium heat; cook and stir onion, celery, and garlic until softened, 5 to 10 minutes. Add green bell pepper and jalapeno peppers to onion mixture; cook and stir until peppers are softened, about 5 minutes. Pour tequila into vegetable mixture and simmer until slightly reduced, 3 to 4 minutes. 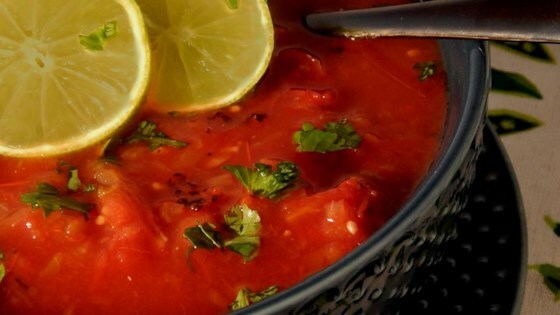 Add fired-roasted tomatoes, vegetable stock, crushed tomatoes, lime juice, salt, and pepper to vegetable-tequila mixture; bring to a boil. Reduce heat to medium-low and simmer until flavors have blended, about 20 minutes. Stir cilantro into soup just before serving. I doubled it for an event and added a teaspoon (or a bit more) of smoky paprika to the soup. This recipe is amazing! Thanks for sharing. It will be a staple at our house now. Made it exactly as shown (minus celery) and we loved it. The tequila lime jalapeño flavor combo was really good. Will make again.